FREE Home Security Survey - Is Your Property Safe? In 2018 there was, on average, one burglary every day in Bognor Regis and 4 a day in Central Portsmouth! Across the UK, there are over 450,000 homes burgled a year. So how safe and secure is your property? Do you need to consider improving your home or your business's level of security? To deter potential intruders from committing a burglary, one of the best solutions is to have multiple layers of security that will discourage an intruder from attempting to break in to your property. Locks - How strong are your locks? How many locks do you have on your exit doors? What type of locks are they? Are your locks British Standard (can you see the kite mark?). These are all questions we can help answer for you. Most burglaries happen by breaking in through the front door or window. Having strong lock mechanisms that are visible will help to deter a potential intruder. At Lockforce, we only install anti-snap cylinder locks as a minimum. We also install the Ultion TS007 3⭐︎⭐︎⭐︎ lock, the ultimate in lock security. Ultion locks come with a £1000 guarantee and are Police Approved. Please click here to see it’s credentials...https://vimeo.com/301610626. The most common question we are asked regarding lock upgrades, is how much? You should never economise when it comes to security. Just ask yourself how much are the contents of your house worth? Are your car keys secure? What do you value your family’s security at? These are the key questions, not the price of the lock. Are your doors locked? - There are approximately 900 homes broken into through the door every day across the UK! It may sound silly, but many homeowners forget to lock their doors! Do you have window locks and do they work? Ensuring your property is locked at night and also when you are at home alone is also a preventative measure. Did you know nearly 60% of burglaries occur whilst you’re at home. Home Security Systems - Invest in the best home security system with a burglar alarm installed at all exit points. There are many other types of security systems to choose from including CCTV and exterior lighting. These are all great visual deterrents. Please ask Lockforce for further advice. When was the last time you checked your locks? - At Lockforce we offer a FREE home security check. Being your local trusted locksmith, our aim is to keep our local community safe and secure. Your property’s security should be your no.1 priority. At Lockforce, we can visit your property at a suitable time and assess your level of security you currently have. We will then make recommendations to help you and your property be safer and secure. At Lockforce, we also give you the chance to see how strong (or weak) your cylinder locks are by giving you the opportunity to snap a lock on my lock snapping board (see pic). You will be shocked how weak most cylinder locks are!! Did you know 85% of lock break-ins are by lock-snapping? Lock-snapping means an intruder could be in your home within 10 seconds by using basic tools to break a snap euro cylinder lock! Please call Lee at Lockforce on 07841449582 if you would like a FREE home security survey. 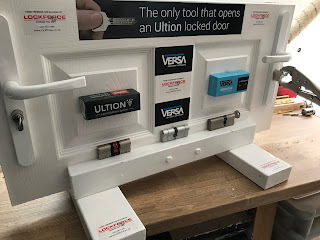 Lockforce….Keeping You Safe!